Hand Butter Churn will churn 2.5 quarts of cream into fresh delicious butter in approximately 25 minutes. 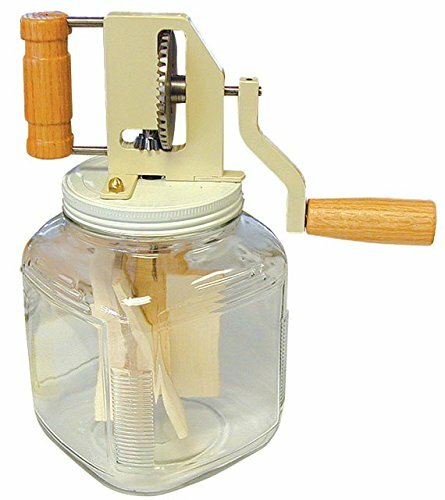 Churn features a 4-to-1 gear ratio, balanced grip, stainless steel machine-cut gears, steel frame, nylon bearings, maple wood paddles (dasher), oak handle and thick Anchor-Hocking glass jar. Everything set in solid steel with solid stainless steel shafts. No plastic frames or gears. Very stable, low-center of gravity design. Fully assembled and ready to use, instructions are included. Very high quality American-made churn with a heavy frame cut out of a solid 1/2 steel plate All components are stainless except the solid plate frame which has a durable powder coated paint. 100% Made In USA, not just assembled here out of imported components but each component is also actually made here! If you have any questions about this product by Tamarack, contact us by completing and submitting the form below. If you are looking for a specif part number, please include it with your message.